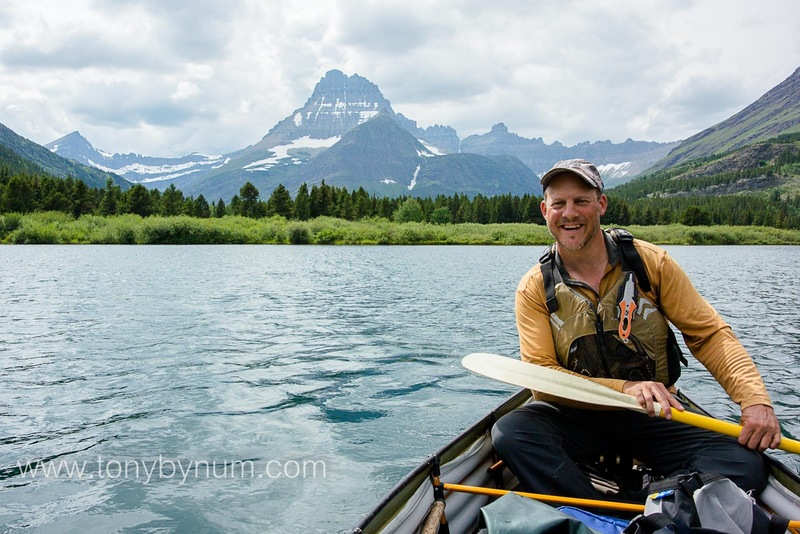 Glacier National Park, Paddling, Fishing, Photography - virtually alone! As if paddling a canoe across Swiftcurrent lake, in Glacier National Park wasn't exciting enough, how about paddling it upstream, toward a sign posted on a bridge that read, "no rental boats in the stream." We knew that if we could make it beyond the sign, we would see few if anyone else along our journey. As we gently pulled through the parking lot at Many Glacier neither Stacy or I ever imagined the volume of cars and people in Glacier Park on this day. In all my years of being in Glacier National Park (I've lived here since 2002), I'd never seen anything approaching the numbers I saw on July 2, 2016 (keep in mind I always try to avoid crowds in the park and it is seldom that I'm anywhere near the popular spots during the middle of the day). The entire road from the Swiftcurrent lodge to the Swiftcurrent Motor Inn was lined, both sides with cars. There was even an enforcement officer issuing parking tickets to those that choose to drop their vehicle without considering that parking rules still apply. 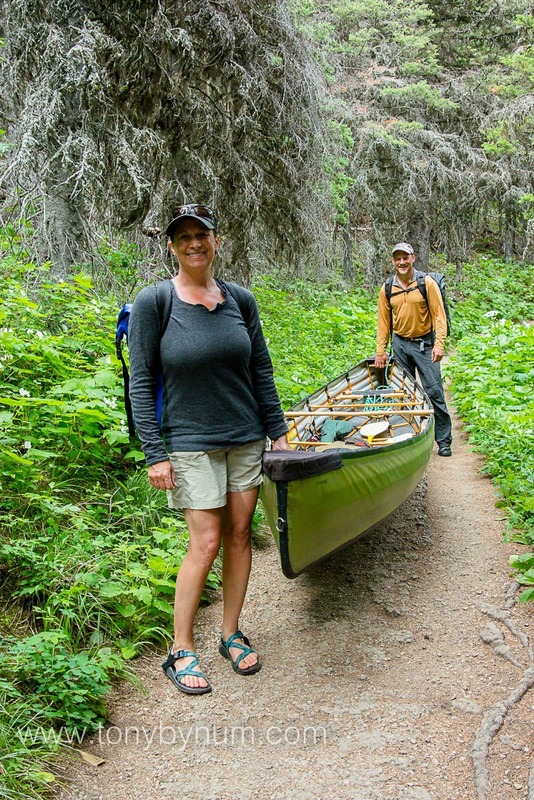 No matter for us, we were about to embark on a simple, but spectacular adventure in Glacier National Park. One where we would see few other people - certainly for part of the trip, NO ONE ELSE around! This is an adventure that just about anyone with a little motivation, some simple planning, and follow through can accomplish. As we eased our way down to Swiftcurrent Lake, I could hear a man shouting, continuously, the names of his children. Over and over, "Chad . . . Mark . . !!!" as if they were in the city still, and his kids were lost someplace among the towering skyscrapers. I replied, "stop yelling," to which he screamed back at me, "mind your own business!!!" I laughed quietly as I watched his kids scamper along the lake shore - in complete sight of their father and visa versa mind you. A minute later I looked up and could see him being scolded by his wife as they stood in the doorway of their 35 foot, 1990's vintage mobile sleeping quarters complete with the bounding kangaroo printed on the side. Classic "vacation" for people from the city who think Glacier is an amusement park. Boy how things have changed over the years . 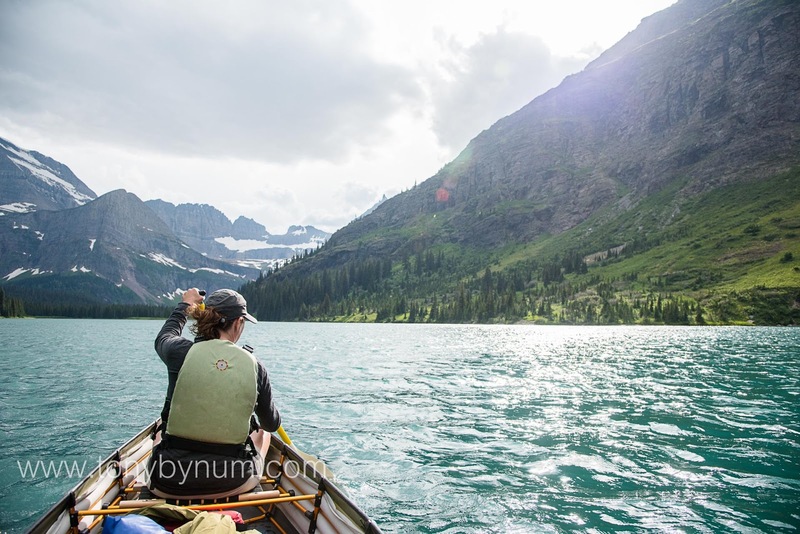 . .
We dropped the Pakboat canoe in the lake, loaded up our provisions and paddled up Swiftcurrent Lake. 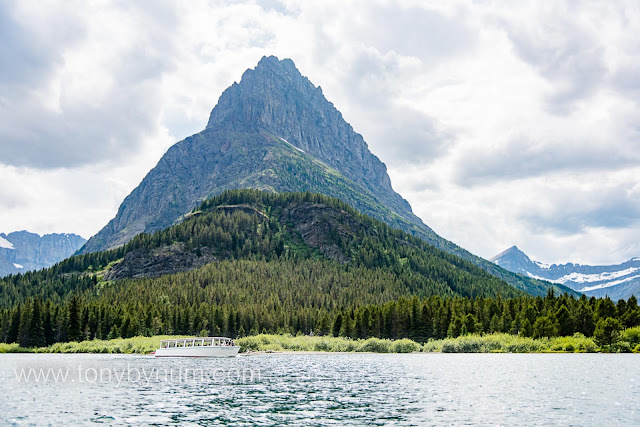 Grinnell Peak loomed large on the west side of the lake while the Swiftcurrent Lodge rose high above the east shore. Along the way we encountered the boat named, "Chief Two Guns." A spectacular location, one of the most beautiful in all of Glacier National Park. 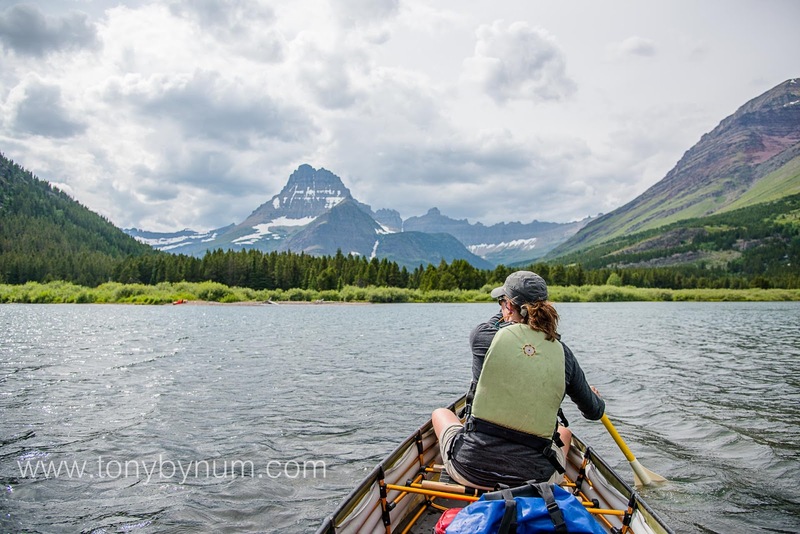 Our mission was to paddle Swiftcurrent Lake, investigate the stream that connects Lake Josephine to Swiftcurrent and either paddle up the creek, or portage the Pakboat up the trail to Lake Josehpine. Few if any people ever portage a 17 foot boat in Glacier Park, but the Pakboat is made light-enough to do just that, so we did it. The creek was a little to swift to paddle up, so we decided on plan b, the portage. We put all of our gear in our dry bag backpacks and carried the boat between the two of us, one in front, one in back - it turned out great. The trail is a quarter mile long and ends up at a nice beach on the shore of Lake Josephine. We again dropped the boat in the lake, loaded it with our provisions - some food and beverages, a couple fishing poles and of course cameras - and headed up the lake! We paddled a bit following a large boat (Morning Eagle) operated by Glacier Park Boat Company (Follow this link for more information and the history of Glacier Park Boat Company). 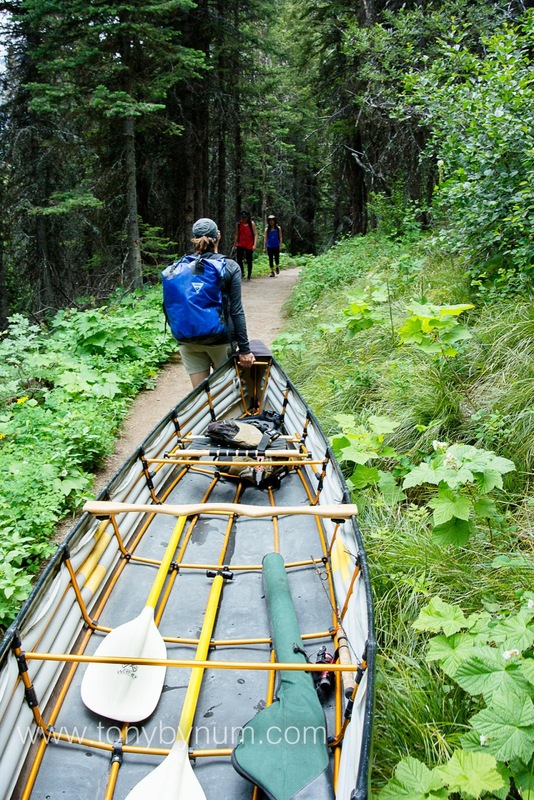 You can pay for the tour if you like, but we prefer our own canoe . . . Later, about half way up the lake, we were met by a stiff head-wind and decided at that point to turn back and head down the creek that connects Josephine and Swiftcurrent lakes. The creek has a sheltered entrance just up the west shore from the boat dock. It's sheltered from the wind and very easy to paddle, even beginners could navigate the moderately slow stream. We saw and heard lots of birds, a beaver and at one point we could smell the clean hint of wildflowers. Tony Bynum casting a fishing pole in Swiftcurrent Lake. No fish were harmed in the making of, or during this trip. I guess I've lost my touch - not even a bit all day long! A reminder. 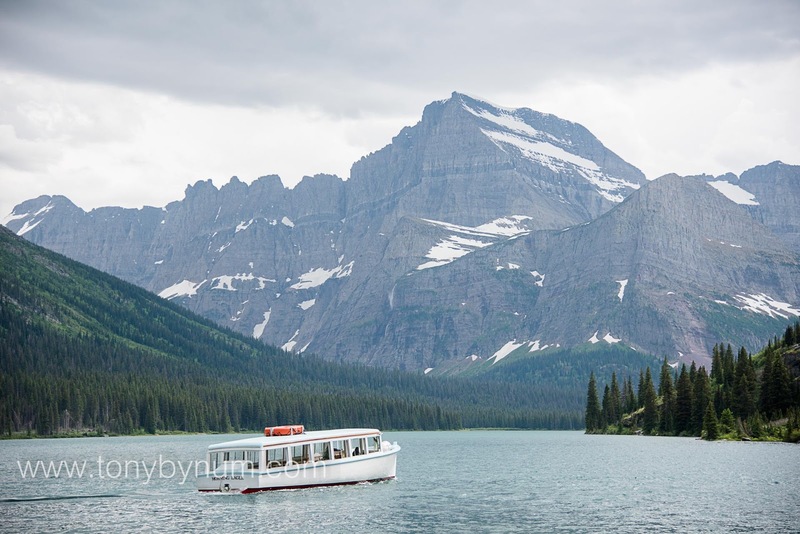 If you plan to take a boat into Glacier National Park, be sure to read the new rules. Personal watercraft can be self inspected and for motor boats, you'll need to have them inspected by the park service. 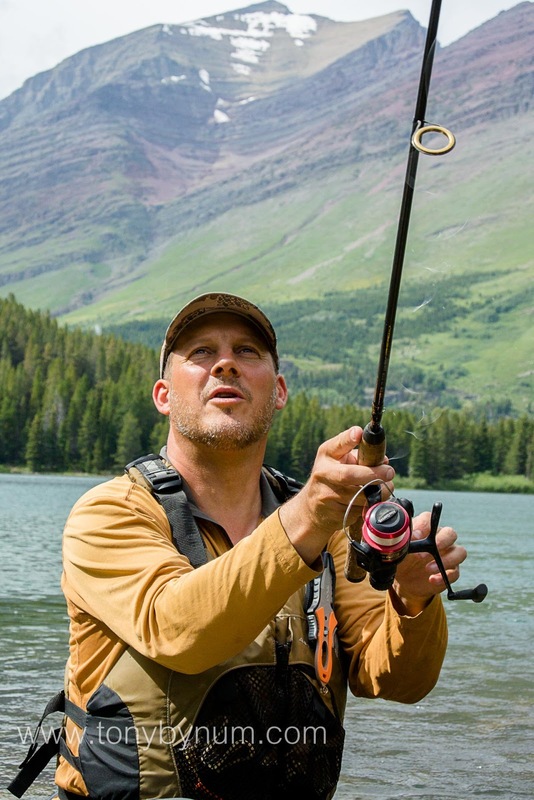 Here's a link to the details about boating and permits in Glacier National Park. We had a great trip. It's nice to know that we have such a spectacular place to go. Glacier National Park is part of our public domain. It's managed for the benefit of all. Sure, there are managment issues, but to those who would choose to sell or transfer ownership of this great land legacy to a third party, I say RUBBISH! #keepitpublic #ourwild #nationalparks #glacierpark Please be advised. Taking public lands away from it's owners could be hazardous to your political career! People ask often, what gear I use. Here are few from this trip. Without this gear, my adventures both in Glacier National Park, and abroad would not be possible. This is not a paid advertisement, this is a personal trip I took in Glacier National Park. No payment was rendered during or after the adventure. Werner Paddles - for this trip we used the Werner Nantahala canoe paddle. 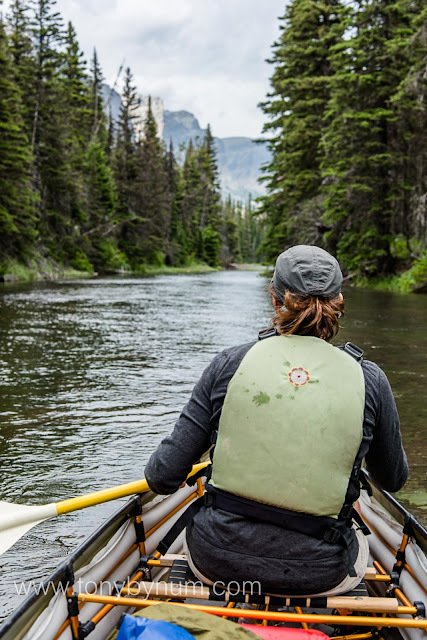 Lightweight, strong, and built for river's and flat water paddling. Pakboats - we used a Pakboat Wilderness 170, the workhorse of their line up. What a boat! I've had this boat on all types of water from class III to lakes and would not trade it for anything . . .
Over Board camera bags - This is the DSLR Pro model. It goes on every single water adventure I do. I've had this bag in waters from Montana to New Zealand and it's works! This is not a paid advertisement, these blog posts are my own. While I do often receive gear and occasionally payment from sponsors, this post was not paid. This was our adventure and our's alone!